The Worldview tool from NASA's Earth Observing System Data and Information System (EOSDIS) provides the capability to interactively browse over 800 global, full-resolution satellite imagery layers and then download the underlying data. Many of the imagery layers are updated within three hours of observation, essentially showing the entire Earth as it looks "right now". This supports time-critical application areas such as wildfire management, air quality measurements, and flood monitoring. View current natural hazards and events using the Events tab which reveals a list of natural events, including wildfires, tropical storms, and volcanic eruptions. Animate the imagery over time. Arctic and Antarctic views of many products are also available for a "full globe" perspective. Browsing on tablet and smartphone devices is generally supported for mobile access to the imagery. 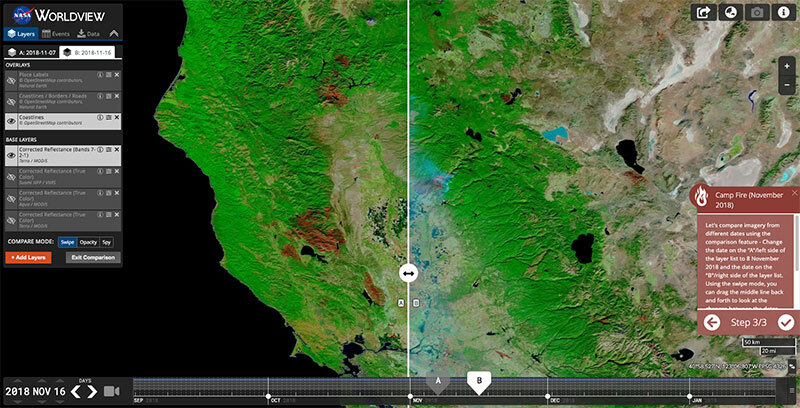 Worldview uses NASA's Global Imagery Browse Services (GIBS) to rapidly retrieve its imagery for an interactive browsing experience. While Worldview uses OpenLayers as its mapping library, GIBS imagery can also be accessed from Google Earth, NASA WorldWind, and several other clients. We encourage interested developers to build their own clients or integrate NASA imagery into their existing ones using these services. Comments/suggestions/problem reports are welcome via Earthdata Support. View frequently asked questions (FAQ) about Worldview.